The importance of having a litigation attorney advising you cannot be stressed enough. We understand that there may be financial reasons that cause people to consider representing themselves in court. However, because of the intricacies of the law and the rules litigants must follow, minor mistakes in self-representation can end up costing more than hiring a qualified and experienced attorney. With the above aside, if you decide to provide your own representation in court, please consider this list of the 10 most common litigation mistakes made by self-represented individuals. While there is a lot of useful information available on the Internet, there is also a lot of incorrect information. Even websites for the courts, at times, contain out of date; and therefore, inaccurate information. Additionally, the Internet cannot teach a person how to handle a matter that generally takes years of experience to fully understand. The Internet will provide basic information. However, the advice and coaching of an experienced attorney is truly necessary for an unrepresented party to properly handle a lawsuit. Have you been involved in a case that was lost because of a simple litigation mistake? If so feel free to comment below. Requests for admissions are questions served on the opposing party that asks the opposing party to admit or deny certain facts. Generally, the facts that the opposing side are asked to admit are critical to the case. The failure to respond to the requests for admissions within the required time results in the admissions being deemed admitted. This can be extremely damaging to a party’s case or defense. Most court cases can be broken down into a few critical issues. However, there may have been a number of issues or disputes that occurred between opposing parties to a lawsuit prior to the lawsuit being filed. These prior disputes or issues may have little to nothing to do with the lawsuit. And, the court will have little interest in hearing about them. A party who has little experience with lawsuits and appearing in court may believe it is necessary to go into the details of these issues or disputes. In reality, addressing these items only hurts their case because it draws attention away from the critical issues. It also hurts the party’s credibility when they finally get around to addressing the critical issues. Litigation can be an emotional process. People do not think as clearly when emotions are high. This leads to poor decision making. These poor decisions can be seen in deciding whether to take a settlement offer. It can also be seen in the work performed, motions filed, and evidence presented to the court. The most successful parties in litigation are not always the ones who have the best case. Instead, it is generally the party who uses a cost-benefit analysis to make decisions during the course of the litigation. By making a cost-benefit analysis the party can decide what work should be performed, what motions should be filed when to settle the case, and what needs to be presented to the court. The disclosure rules require each party to disclose the legal basis for their claim or defense, the names of all witnesses and a list of documents that will be presented. The disclosures must be updated as new witnesses and documents are revealed. If documents and witnesses are not timely disclosed, they may not be used at trial. Proper disclosure also means Bates labeling and organizing the documents so that it is clear to the court and the other side that documents to be presented at trial or a hearing have been disclosed. Bates labeling refers to the placing of a sequential number scheme somewhere on each and every document. Then each time a new document is disclosed it should be accompanied by a disclosure statement that lists the document and the corresponding number. The other side may object at trial to the introduction of a document on the basis that it has not been disclosed. There should be no difficulty in proving that it has been disclosed if it is Bates labeled and reflected on a disclosure statement. If either of these items is missing, it may be difficult to show that it has been disclosed and the court may preclude the document from being used. The two most common dispositive motions are motions to dismiss and motions for summary judgment. Both of these motions seek a partial or full resolution of the issues in the case. A motion to dismiss is generally based solely upon the law. A proper response will give a legal basis for the denial of the motion. A motion for summary judgment is generally based upon facts and law. A motion for summary judgment must be accompanied by a separate statement of facts. If facts set forth in a separate statement of facts are not properly controverted, they will be deemed admitted. Having the facts deemed admitted can be very damaging to a party’s claims or defense. Preparing for a trial is no simple task. Exhibits must be identified, marked and organized so that they are easy to locate and present. Opening statements, direct examinations, cross examinations and closing argument must be outlined. Finally, each side needs to be prepared to present and argue any outstanding legal issues. Not putting in the time to prepare and “winging it” will not work. 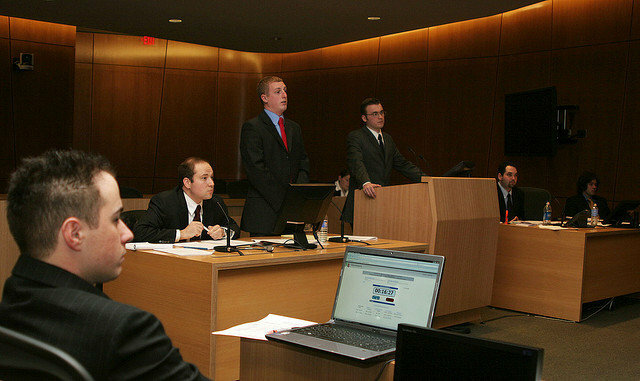 Even if a person has a strong case, they may very well lose at trial if the presentation is lacking. Every party to a lawsuit is responsible for keeping their contact information current with the court and opposing counsel. However, parties sometimes move and fail to update their contact information with the court. Important documents may be filed with the court and mailed to the party at their address of record. However, if the address is not current, the party may not receive the documents. This may result in that party not timely responding to the documents. The court will generally not accept the fact that the party failed to update their contact information as a defense for failing to timely respond to discovery or motions. Legal research can be complicated. The key to legal research is knowing where to look and what to look for. The law that applies to a particular case is generally found in statutes, regulations and published cases. Arizona Revised Statutes and the Arizona Administrative Code can be found on the internet at http://www.azleg.gov/ArizonaRevisedStatutes.asp and http://www.azsos.gov/public_services/table_of_contents.htm, respectively. Case law can be found in online databases that generally have a cost associated with them. It can also be found at a law library. Case law research at the law library will generally require the assistance of a librarian as there is a three step process to finding relevant case law. There is also a wealth of case law and relevant application available on the web, often in blogs like this one from law firms. However, it is vital to make sure that when you research case law, you keep in mind that the information you find on the internet may 1) not be accurate, 2) not be applicable in your jurisdiction, and 3) not up-to-date. In order for a party to represent themselves without the assistance of an attorney, they will need to know how to perform the necessary legal research to locate the law that applies to their case. This is probably the single most common, yet easiest mistake to avoid. An answer to a complaint must be signed by each and every defendant or by their attorney. It is not uncommon for a married couple to assume that one spouse can properly sign the answer. This is not true. If only one spouse signs the answer, then a default judgment may be entered against the other spouse’s sole and separate property. This mistake is also commonly made when a corporation or llc is a defendant in the superior court. A corporation and llc may not represent itself in the superior court. This means it must hire an attorney who must sign the answer. If an owner and employee signs and files the answer on behalf of an entity in superior court, a default judgment may be entered against the entity.